Rev Mike Coleman, Avonside, Christchurch. Child wellbeing is a political issue, so watch out for it in the coming election campaigns. To help us along, we've given it a high profile in our 10th Vulnerability Report. NZCCSS services report growing demand for family services. At the same time, the Ministry of Social Development reports 231,488 benefit dependent children. Yet around 2 in 5 poor children live in households where at least one adult is in full time employment more . Help create a more equal society for our children. Click here to support NZCCSS’s work to reduce inequality. It must be really embarrassing to go to an international forum and confess that your indigenous people make up half of your country’s prison population. The other countries must wonder why the indigenous people are in jail in such high numbers in their own home. Not a good look for the rest of us. Mason Durie points out that around 50% of Māori boys leave school with no qualifications. Given the youth of our Māori population, the whole country stands to feel the negative economic impact. Tai Wananga Tu Toa is a new style of Maori school aimed at improving the results and so far shows a 98% pass rate in NCEA. 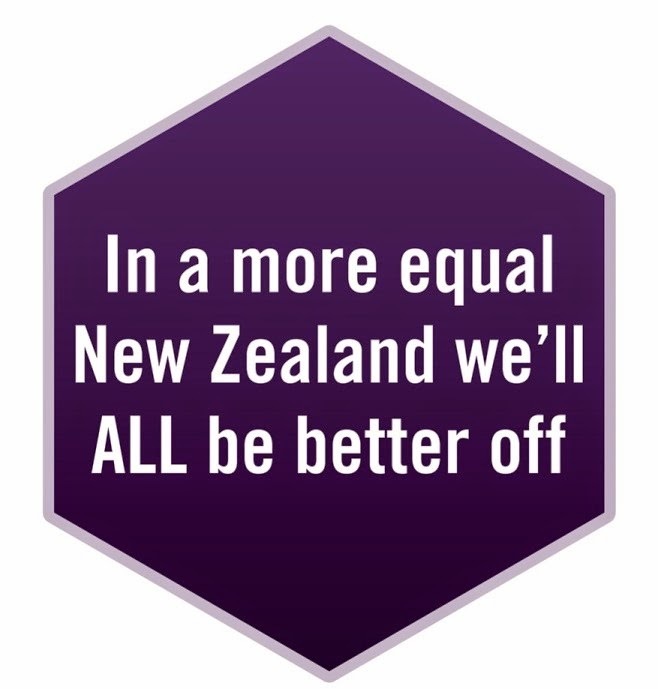 Meantime, (and not surprisingly), Te Puni Kokiri is providing reports calling for a Maori-led approach to reduce the high imprisonment rate for Maori as the current foreign models have failed. If life improves for Māori, we all look better on the international stage. Work is what we do when we go out, do a job, get paid at the end of the fortnight, right? Or when we run a company and pay our employees at the end of the fortnight? Or when we have our own business and hope that there is some money for us after the bills have been paid at the end of the fortnight? Yes – we all agree on that? What about: Helping out at playcentre? Caring for an elderly relative? Bringing up our children? Mmm – not so sure this is work. Ok then, how about this? A woman profiled in the Waikato Times has been collecting a benefit for the last 10 years. Doesn’t look good, does it? But – turns out Waikato’s longest claiming beneficiary has been caring for her sick, elderly mother all this time. In fact, as Poverty Action Waikato points out, her ‘non work’ has just saved the taxpayer around $400,000 in senior care. Carers New Zealand and the Ministry of Health are conducting a survey about respite care needs for carers of older family members. They want to find out about: types of respite care you would most like to use, problems or issues you have booking or using respite care, carers’ information needs; planning respite care; improving information about and access to respite services more. They are gathering responses from carers of older people until 5pm, Friday 7th October 2011. Click on the link https://www.surveymonkey.com/s/MDNZPFQ to participate. The Crimes Amendment Bill (No 2) which protects vulnerable children and adults from abuse and neglect has been passed. People who are over 18 and are a member of the same household, or are very closely connected to the household, or are a staff member of a hospital or institution where the victim resides, have a legal duty to take reasonable steps to protect the victim at risk of death, grievous bodily harm, or sexual assault as a consequence of an unlawful act or grossly negligent omission by a third party. Failing to take reasonable steps carries a maximum penalty of 10 years' imprisonment. The bill ‘extends the offence of ill-treatment or neglect of a child to include vulnerable adults – those in care because of their age, detention, sickness, or mental impairment. Parents and caregivers must provide children and vulnerable adults with both the necessaries of life, and also take reasonable steps to protect them from injury.’ Ignorance or thoughtlessness is not a defence. Does this Bill pre-empt the Green Paper for Vulnerable Children? One of the issues the paper considers is mandatory reporting of child abuse by professionals. While everyone wants our children and vulnerable adults to be well looked after, is this legislation also part of the growing ‘personal responsibility theme’ similar to welfare reform (find a job); the Family Court Review (‘personal responsibility to be emphasised’); and the Green Paper for Vulnerable Children (‘communities take more responsibility for child wellbeing’)? The Family Court serves children and their families. Government is concerned the amount of time taken to reach decisions has grown, and so has the accompanying cost. They also express concern about the negative impact of conflict on children. Hence the Family Court review. Government priorities here include: prioritising vulnerable people and children; encouraging people to resolve their disputes outside court, with the court a last resort; emphasising personal responsibility; costs of accessing the courts are to be met by users(where appropriate), improved timeframes to avoid re-litigation; and taxpayer affordability. There is a discussion document and submissions close on 29 February 2012. People who have used the Family Court or have sought family legal advice can complete an online questionnaire about their experiences to feed into the review more . Some have expressed concern there is no consumer representation on the Family Court Review Reference Panel. There are a lot of us born between the late 1940s and the early 1960s. And we are getting older. Many of us are likely to get dementia. The World Alzheimer Report 2011 has just been released http://www.alz.co.uk/research/world-report-2011, which suggests that only 40% of dementia cases are recognised in countries like New Zealand. That means more than 26,000 kiwis could have dementia but it is not diagnosed. The report suggests earlier diagnosis could save the country more than $31 million. Auckland has a draft 30-50 year strategic plan open for submissions. The plan builds on the Auckland Unleashed discussion document, and submissions are due by 4pm, Tuesday, 25 October 2011. There are a number of discussion meetings . People can make submissions by writing a letter to post your letter to Freepost 237170, Auckland Council, Private Bag 92300, Auckland 1142 (no stamp required), faxing it to (09) 570-3846; emailing theaucklandplan@aucklandcouncil.govt.nz; online here, http://www.theaucklandplan.govt.nz/, the online submission form here, or use the submission box at any library, Auckland Council service centre or at Maungakiekie-Tamaki Local Board Office (7-13 Pilkington Road, next to the Panmure Library). More. Shakti Asian’s Women’s Safehouse has received an $18,250 grant from Medibank Community Fund. Shakti Asian Women’s Safehouse Inc. operates four refuges in New Zealand for women of Asian, Middle Eastern and African ethnicity. The houses provide culturally appropriate accommodation and domestic violence intervention services. The grant is one of four provided to new Zealand organisations. Applications for the 2011/2012 grants are open, and community groups are encouraged to apply. Applications can be found at Medibank Community Fund website. Election resources: Are you planning election resources? We want to collect and make available church –based election resources. Here are some from the Otago Centre for Public Theology. Older adults in New Zealand: Population changes, health, service use and workforce needs. Jigsaw National Conference, Te Papa, Wellington, 2-4November 2011. Our religious and philosophical teachings tell us that human suffering anywhere must be accepted as our own suffering. And our worldly experience convinces us that only practical political action can help end that suffering. I understand Mason Durie's concern for Maori leaving without qualifications...it worries me too, because in many years as a prison chaplain in Scotland those misfits in society, most were illiterate, and education classes were introduced with success. Further study in Scotland pins the problem to leaving primary school unable to read and write. So more money was spent in primary remedial teachers etc, and the offending rate has gone DOWN. The change is seen in the secondary schools, no disturbances, attentive understanding boys, no disruption from little groups at the back of the class, and no drift into gangs, scholastic attainment raised integrated into normal society, This has all happened. So NZ has to spend money in primary education and not on building more prisons.